Vladimir Putin stands accused in the media and global public opinion of rigging his recent reelection, imprisoning his political enemies, murdering Russian spies turned double-agent, meddling in Western elections, seizing Crimea, destabilizing Ukraine, supporting a murderous dictator in Syria and exporting arms to terrorist nations like Iran. At the same time, the country of Russia is more than Mr. Putin, despite his authoritarian and heavy-handed methods. Russia is the world’s 12th-largest economy, with a GDP in excess of $1.5 trillion, larger than many developed economies such as Australia (No. 13), Spain (No. 14) and the Netherlands (No. 18). Its export sector produces a positive balance of trade for Russia, currently running at over $16 billion per month. Russia has not had a trade deficit in over 20 years. Russia is also the world’s largest oil producer, with output of 10.6 million barrels per day, larger than both Saudi Arabia and the United States. Russia has the largest landmass of any country in the world and a population of 144 million people, the ninth largest of any country. Russia is also the third-largest gold-producing nation in the world, with total production of 250 tons per year, about 8% of total global output and solidly ahead of the U.S., Canada and South Africa. Russia is highly competitive in the export of nuclear power plants, advanced weaponry, space technology, agricultural products and it has an educated workforce. Russia’s government debt-to-GDP ratio is 12.6%, which is trivial compared with 253% for Japan, 105% for the United States and 68% for Germany. Russia’s external dollar-denominated debt is also quite low compared with the huge dollar-debt burdens of other emerging-market economies such as Turkey, Indonesia and China. Under the steady leadership of central bank head Elvira Nabiullina, the Central Bank of Russia has rebuilt its hard currency reserves after those reserves were severely depleted in 2015 following the collapse in oil prices that began in 2014. Total gold reserves rose from 1,275 tons in July 2015 to about 2,000 tons today. Russia’s gold-to-GDP ratio is the highest in the world and more than double those of the U.S. and China. In short, Russia is a country to be reckoned with despite the intense dislike for its leader from Western powers. It can be disliked but it cannot be ignored. Russia is even more important geopolitically than these favorable metrics suggest. Russia and the U.S. are likely to improve relations and move closer together despite the current animosity over election meddling and the attempted murders of ex-Russian spies. The reason for this coming thaw has to do with the dynamics of global geopolitics. There are only three countries in the world that are rightly regarded as primary powers — the U.S., Russia and China. These three are the only superpowers. Some analysts may be surprised to see Russia on the superpower list, but the facts are indisputable. More to the point, Russia is a nuclear superpower at least on par with the United States and well ahead of China, France, the U.K. and other nuclear powers. All others are secondary powers (U.K., France, Germany, Japan, Israel, etc.) or tertiary powers (Iran, Turkey, India, Pakistan, Saudi Arabia, etc.). This strategic reality sets up a predictable three-party dynamic. In any three-party dynamic, whether it’s a poker game or a struggle for global control, the dynamic is simple. Two of the powers align explicitly or implicitly against the third. The two-aligned powers refrain from using their power against each other in order to conserve it for use against the third power. Meanwhile, the third power, the “odd man out,” suffers from having to expend military and economic resources to fend off adventurism by both of its opponents with no help from either. 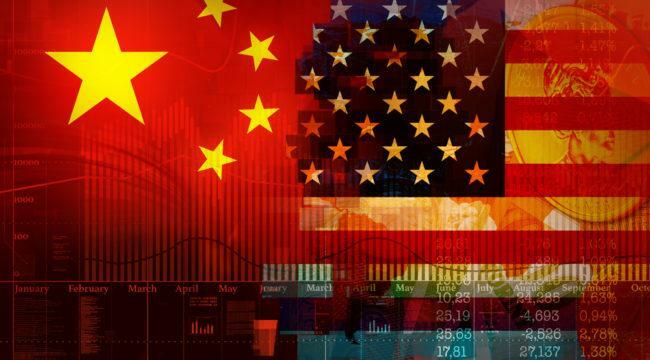 China is the greatest geopolitical threat to the U.S. because of its economic and technological advances and its ambition to push the U.S. out of the Western Pacific sphere of influence. Russia may be a threat to some of its neighbors, but it is far less of a threat to U.S. strategic interests. Therefore, a logical balance of power in the world would be for the U.S. and Russia to find common ground in the containment of China and to jointly pursue the reduction of Chinese power. One of the keys to U.S. foreign policy the last 50 or 60 years has been to make sure that Russia and China never form an alliance. Keeping them separated was key, but China and Russia are forging stronger ties through the Shanghai Cooperation Organization – a military and economic treaty – and the BRICS institutions. The BRICS analogs to the IMF and the World Bank, critical infrastructure, bilateral trade deals, bilateral currency swaps, arms sales, etc. Meanwhile, the U.S. finds itself at odds with both Russia and China over different issues. Who’s on the losing end of that? Obviously, the United States. This two-against-one strategic alignment of China and Russia against the U.S. is a strategic blunder by the U.S. The United States has largely withdrawn from the Middle East while Russia has stepped in on Syria and elsewhere, China is expanding in the South China Sea, and Russia is expanding on its periphery. They have each other’s back, and the U.S. is the odd man out. But the Russian/Chinese relationship can be exploited. China and Russia have a history of conflicting interests, despite the fact that they were both communist during the Cold War. The Soviets even considered a preemptive nuclear attack on Chinese nuclear facilities. Soviet officials advised Washington of the possibility, but the U.S. response was firm, warning that any nuclear attack would possibly lead to World War III. The point being, there are fissures in the Chinese-Russian relationship that the U.S. could exploit. For another thing, the U.S. and Russia are the first and second largest energy producers in the world. Saudi Arabia is the third largest energy producer in the world. If you put the U.S., Russia, and Saudi Arabia in a loose alliance, they dominate the energy markets. They can cut you off, they can supply, they can set prices. Who needs energy the most? China. China has very little oil or natural gas. It does have coal, but if you’ve been to Beijing lately, you know it looks black at noon because the air is so bad and you can’t breathe it. Pulmonary disease is becoming fairly common. They’re literally choking themselves to death. So, Russia, the U.S., and Saudi Arabia acting jointly have China completely at their mercy. But the U.S. presently has no relationship with Russia to help back up our position against China. It’s two-against-one, and the U.S. is the odd man out — thanks to U.S. political dysfunction and the media. In a three-handed poker game, if you don’t know who the sucker is, you’re the sucker. Trump will try to make China the odd man out. Very few people seem to get this. As China’s power expands and as U.S. power is put to the test in Asia, it is likely that the U.S. will correct its recent strategic shortsightedness and find ways to work with Russia. Or at least it should. This will not be done out of wishful thinking about the true nature of Putin or his regime but as a simple matter of geopolitical necessity.